This seems to contradict City Hall's stated desire to recast Dallas as "the greenest city in America"—or so proclaimed Mayor Tom Leppert last January when the Environmental Protection Agency recognized the city of Dallas for its use of renewable power. City officials seem eager to promote eco-friendly activities. The Sustainable Skylines Initiative, a joint federal, state and local effort to improve the city's air quality, attracted science luminaries to its Dallas conference this March, and Earth Day and Arbor Day celebrations abound here in April. But just how serious is the city about changing its support for developers and their antiquated clear-build-sell mentality—one that views trees as obstacles to be gotten rid of, or aesthetically pleasing amenities that can raise the price of their expansive subdivisions or high-rise condos? The city talks a good game. In the past few years, local tree activists such as Steve Houser have made inroads at City Hall, beginning with the establishment of an Urban Forestry Advisory Committee, which instructs the city on the care and planting of trees and advocates sound urban forest management practices. The city has endorsed the efforts of the nonprofit Texas Trees Foundation, which this March is scheduled to kickoff its "Road Map to Tree Planning and Planting in Dallas," an ambitious plan for planting thousands of trees around the city. And the city, as part of the Trinity River Corridor Project, has dedicated bond money to developing the Great Trinity Forest—at more than 6,000 acres, the largest urban hardwood forest in the United States. Aside from the limited efforts of nonprofits and the advisory committee, there is no coordinated citywide effort to plant, replant and maintain trees. The lack of an office of urban forestry means that there is no central oversight authority for Dallas' urban forest. A tree survey, which would inventory the billions of dollars of environmental and financial assets in Dallas' urban forest, has never made it into the city budget; further, the city's unwillingness to strengthen its toothless tree ordinance has only exacerbated Dallas' long and troubled history regarding the stewardship of its trees. And if the city's response to what happened at Grady Niblo is any indication of its new arboreal consciousness, Dallas has a long way to go before its rhetoric matches its reality. Minutes from the Grady Niblo moonscape, a grove of ancient, gnarled bur oaks grows tall near the center of Dallas. They soar into the breezy February sky, providing perfect nooks for birds' nests and sylvan views for patients at Presbyterian Hospital of Dallas. There's a creek bed behind the labor and delivery building, and it, too, is lined with the deep arcs of massive trunks and a tangle of bushes and shrubs. This grove is where Dallas' tree movement began in earnest when in 1994, the hospital flirted with its own version of a treeless moonscape. Steve Houser, a wiry, blue-eyed sprite of a man with boundless energy, played an integral role: that of the arborist who refused to do his job. Houser owns the tree company Arborilogical Services Inc., whose largest single client in the '80s was Presbyterian Hospital. In 1989, he helped the hospital find a way to build a new day-care center around two of the oldest bur oaks on its property. According to Bill Seaman, then the hospital's grounds manager, Houser got up in the trees himself, wrapping their branches with scraps of carpet to keep them from rubbing up against the nearby drilling machines during construction. The epitome of a tree-hugger, Houser was appalled in 1994 when Presbyterian told him to cut down more than 30 trees on its property to make room for a new power plant. "I had to do some soul-searching," Houser recalls. "I thought, 'I don't want to lose my biggest account. But do I want to live for the almighty dollar all my life or do what I know in my heart is the right thing?'" He turned down the job, instead helping mount an advocacy campaign to save the trees. Houser and other local tree advocates solicited enough money to post a two-page ad in The Dallas Morning News, in which they announced the formation of the Dallas Historic Tree Coalition, which opposed Presbyterian's tree-cutting plans. Calls and donations poured in, and the ranks of the coalition grew to hundreds. Presbyterian backed down, agreeing to build the plant where it wouldn't require felling more than a few trees. Despite the victory, Houser decided to let his short blond hair grow, vowing never to cut it until Dallas finally started to care about trees. By the time the dust settled around Presbyterian Hospital, its trees were intact, and Dallas' environmentalists had both a leader (Houser) and a cause (trees). Part of the Historic Tree Coalition's ease in mobilizing support came out of frustration born a year earlier, when Dallas passed its first tree ordinance. While Fort Worth had enacted a tree ordinance in 1873, Dallas—embarrassingly enough—only began working on an ordinance to protect its urban forest in 1990. Two city council advisory committees proposed an original draft with strict penalties: Anyone who wanted to cut down a tree of a certain size would be required to pay between $100 and $500 for a permit and a $400 fine for each tree cut without a permit. The ordinance also would establish the position of city forester, to oversee tree planting and maintenance, and a 15-member City Tree Board, composed of equal parts environmentalists, developers, homeowners and arborists, which would act as an arbiter for tree-related issues. The ordinance, however, was deemed too stringent by some, who saw the idea of conserving a tree as anathema to development. Then-city council member Glenn Box called the ordinance "the most unnecessary, bad idea I've ever seen come before the council," and told The Dallas Morning News in May 1994 that "We might as well just hang signs up around the city saying, Development Not Allowed." Box's view prevailed. The final ordinance, passed by the city council later that month, raised the fine to $2,000 but made its actual levying unlikely. According to the new ordinance, any number of small trees could be removed (even clear-cut) without penalty, and bigger trees could be removed as long as they were later replaced with trees equivalent to the trunk thickness of what had been cut. That meant five 10-inch-thick oaks, with all their attendant benefits—large, older trees release more oxygen, provide more shade and absorb up to 70 times more air pollution than young trees—could be replaced by 50 1-inch saplings. Developers could avoid replanting if they chose to mitigate by donating trees to the city or paying into the reforestation fund. The enacted version also did away with the city forester and tree board, making enforcement nearly impossible since the task of overseeing all trees in Dallas fell to just four city arborists. The ordinance's passage in 1994 accentuated the split between environmentalists and "developers," which in environmental circles had become as nasty an epithet as "tree-hugger" was to the other side. John Giedraitis, the urban forestry program manager for the Texas Forest Service, a state agency focusing on tree-related issues, views the city's tree ordinance as "a development ordinance," not only because of its lax regulations and slap-on-the-wrist disciplinary measures, but also because of development's perennial role in shaping the city's history. Although the ordinance seemed a triumph for developers, there was one hitch: Development and trees would have to co-exist, if not for aesthetic reasons—it is no coincidence that the priciest neighborhoods in Dallas also boast the nicest trees—then for environmental ones. Although nonprofit groups like the Texas Trees Foundation would later begin planting trees near state highways to gauge their effects on air quality, the scientific community has long been aware of the beneficial impact of trees on the atmosphere. Trees store (sequester, in scientific circles) carbon dioxide and release oxygen. In breathing, humans are just the opposite: We use oxygen and release carbon dioxide, so trees are perfect breathing partners. But since global climate change and the harmful effects of atmospheric ozone became widely accepted in the late 1990s, scientists have been looking to trees for answers. In addition to carbon dioxide, trees also sequester harmful air pollutants—ozone, particulate matter, nitrogen oxides, sulfur dioxide and carbon monoxide—many of which, in Dallas, derive largely from vehicle emissions. "In particular with global climate change," explains Janette Monear, executive director of the Texas Trees Foundation, "we need to be planting now for the future, and doing research around which trees can tolerate more drought, which trees can sequester more carbon dioxide, [and] which trees can take up the most amount of water." In cities such as Minneapolis, urban forestry programs have been around as long as women's suffrage, and the benefits are striking. Minneapolis has nearly 1 million trees that cover almost a quarter of its urban area, saving residents $6.8 million in energy costs and injecting an additional $7.1 million into its property values every year, according to a recent study by the U.S. Forest Service. Giedraitis, of the Texas Forest Service, says a similar study in Houston found that a tree raised the property value of a house by an average of $4,000—a number Houser likes to throw out when he advocates that Dallas fund an inventory to value the trees in its own urban forest. "It's like me giving you this portfolio of stocks, and you don't know what's in it," Houser says. "How can we manage an asset we don't understand?" The perpetual push by tree activists for the city to provide meaningful tree protections gained some traction at City Hall after Laura Miller was elected councilwoman in May 1998. "She became a real advocate," says Seaman, who joined forces with Houser after the Presbyterian Hospital imbroglio. "When we had issues that came up, we could actually pick up the phone and call a council person. We'd never been able to do that before." Yet having a friend in a power position wasn't enough to stop two incidents that seemed to corroborate continuing local government indifference to nature preservation. One day before dawn in July 1998, the city of Carrollton took a bulldozer to an egret breeding ground, citing complaints about the noise and "offensive odor" emanating from the area. Many Carrollton residents were outraged; the Morning News published a series of vituperative letters to the editor calling the action a "horrible slaughter" and a "dark-of-night atrocity." Speculations abounded that the rookery had been bulldozed to clear the way for a new senior center. In response, some Carrollton residents formed an advisory Wildlife Task Force. Nothing could bring back more than 300 dead birds—among them cattle egrets and herons—but "it was a way to help resolve the issue," Houser says. A year after the incident, Carrollton was ordered to pay the U.S. Fish and Wildlife Service $70,000 for its violation of the Migratory Bird Treaty Act. Later that summer, Houser and the Historic Tree Coalition confronted the city of Dallas on a similar issue. In June, the city and A.H. Belo Corp. Foundation announced their plan to "upgrade" downtown Dallas' Ferris Plaza by removing 21 mature live oak trees. Though Belo representatives claimed their only intention was to refurbish the park, some coalition members claimed the real motive for cutting down the trees was to displace a noisy, poop-producing grackle population. This issue, Houser recalls, was particularly stressful because it went all the way to the city Board of Adjustment, where the $1 million upgrade plan was ultimately defeated. Houser says he met with power brokers who offered him incentives to back down. "But they don't know me very well," he says. "They can keep the money and the clout. I'll take the trees." Even the election of Miller as mayor in 2002 couldn't stymie the dominance of the developers in the city. Not only was Dallas' tree ordinance weak, it was also under constant threat, says Miller. "The elected officials from the underdeveloped parts of the city want to make it as easy as possible to get their districts developed," she says. "They don't want tree preservation to get in the way of that." To that end, Miller adds, "some council members and certainly the development community wanted to completely reopen the tree ordinance and make it weaker." Miller says she and other tree advocates would scramble to prevent this, trying to reach compromises with individual developers on a case-by-case basis. Though the ordinance requires developers to mitigate for trees they've cut, it does comparatively little to actually limit that cutting in the first place—a fact made obvious by what happened at Grady Niblo. Flower Mound, for example, expressly forbids clear-cutting ("the indiscriminant removal of protected trees"); Dallas does not. Both Flower Mound and Frisco require that the caliper inches (measured in trunk thickness) of mitigation trees exceed rather than just equal what was cut. Fort Worth requires the preservation of one-quarter of the existing tree cover on lots of more than one acre, regardless of tree species, and lists 26 protected species to Dallas' 12. In 2003, tree advocates succeeded in strengthening the ordinance somewhat by giving city arborists the power to issue stop-work orders for developers who were out of compliance. Dallas chief arborist Phil Erwin estimates, however, that fewer than 50 stop-work orders have been handed down since the change, despite the thousands of development permits issued across the city each year. The battle for a viable tree ordinance in Dallas seemed to go unnoticed by the city of Richardson, which in 2004 still didn't have one—and its largest cottonwood tree, 20 feet around and estimated at more than a century old, was then on the verge of being cut down. The insurance company that owned part of the Coit Road shopping center where the cottonwood grew had deemed the tree unsafe and conservation measures (pruning or installing cables) too costly. Houser's bitterness at the prospect of felling the tree was evident in a letter to the editor published in the Morning News on October 4, 2004. "The many benefits of trees...are secondary to the almighty dollar," he wrote. "Since all trees can sustain structural failure, let's cut them all down. When it comes to dollars or liability, trees lose." The tree was cut down a month later. In 2005, Houser did have a modest victory when then-Mayor Miller played a pivotal role in establishing the Urban Forestry Advisory Committee. The full council appointed Houser as committee chair, and he poured his energy into projects like the Citizen Forester program, which trains people to care for and properly plant trees. But the committee lacked any sort of enforcement power over the tree ordinance and didn't have the funding or authority that an office of urban forestry would. Such oversight could have helped craft a coordinated approach to managing the city's trees—and might have prevented last August's tree tragedy at the intersection of Woodall Rodgers and North Central Expressway. 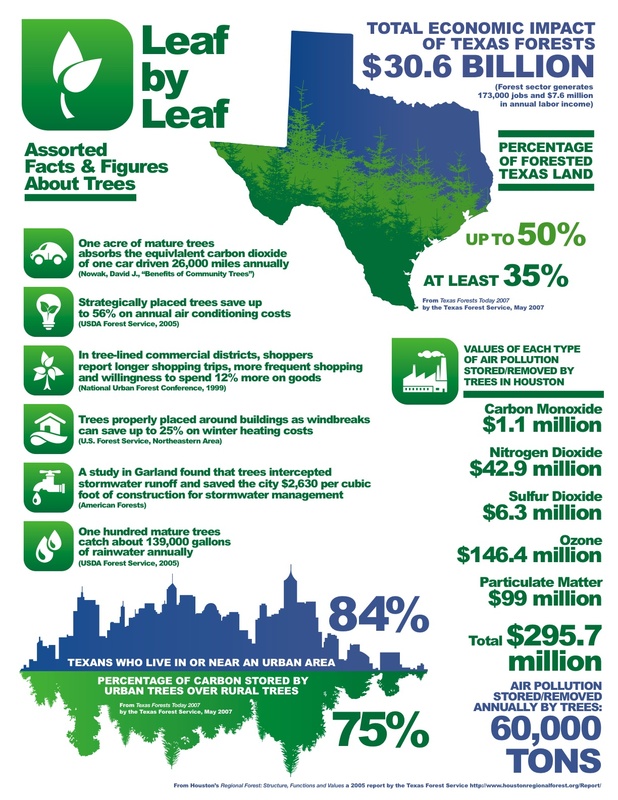 In 2004, in a triangle of green sandwiched between the two highways, the Texas Trees Foundation worked out a deal with the Texas Department of Transportation (TxDOT). The foundation proposed planting a grove of 1,100 bald cypresses—an "air filter for downtown," as the foundation's then-director, Mike Bradshaw, put it. TxDOT owned the land and agreed to the project on the condition that after TxDOT installed an irrigation system and paid for water, the foundation would be responsible for watering the trees for the next five years. But last summer, the trees' water was switched off without anyone's realizing it, says Patrick Haigh, a landscape architect for TxDOT. The result was an enormous loss in resources and potential air-quality improvement: More than 300 trees died, their leaves and branches withering to a reddish-brown in the August heat. The incident illustrated the folly in planting trees without a coordinated oversight system in place to help manage them. Hugh Brooks, the former executive director of the Friends of the Farm, a nonprofit that was attempting to revive city-owned Samuell Farm, says he encountered that same folly after he proposed a plan for a city reforestation tree farm. In the summer of 2006, as part of the mitigation process for the Pinnacle Park mixed-use development in southern Dallas, 200 trees were delivered to Samuell Farm, once a working farm on the border of Mesquite and Sunnyvale. The farm had an ignominious history of animal cruelty and mismanagement; in 2004, Friends of the Farm took over management of the property from the city, attempting to revive it by building hiking trails, refurbishing historic buildings and generally tidying up. When the nonprofit took delivery of the trees, says Brooks, they "showed signs of heat stress and insufficient watering." With his farm's volunteers caring for them, he began to wonder: Why not keep all the city's reforestation trees in one place? At 340 acres, Samuell Farm was big enough to house 7,500 trees, and caring for them would provide work for volunteers and an educational opportunity for visitors. It would cut down on water use and help monitor whether developers had fulfilled their mitigation requirements. There could be a wood-composting site that would provide mulch to aid in tree planting. Brooks secured funding for the project from the Simmons Foundation and asked a city irrigator, Howard Saucier, to draw up plans for the tree farm. In the fall of 2007, he presented them to the Park and Recreation Department. The response was less than favorable, he says. Not only was the Park Department not interested in a tree farm, it also sought to reassert its control over Samuell Farm, says Brooks. Faced with these roadblocks, Brooks decided to go straight to the city council with his proposal. Anticipating a meeting with the mayor, last April he requested information about the reforestation fund from the Park Department's assistant director, Carolyn McKnight-Bray. "We have more than enough trees," McKnight-Bray replied in an e-mail. "We have so many trees we do not need a tree farm to support the Park system." McKnight-Bray added that the problem was maintenance—the city felt it did not have the resources to irrigate and care for more trees. "That is precisely the dilemma that our proposed Tree Farm will address," Brooks fired back a week later. He had the funding, and the farm could use court-ordered community service volunteers to provide tree maintenance. McKnight-Bray had told Brooks that the city was keeping its reforestation trees in a "tree bank," which Brooks asked to see. In a subsequent e-mail, McKnight-Bray revealed that the bank was actually a collection of tree purchases in several nurseries across the metroplex. "Saying they have trees in a tree bank is like saying I have a Ford in every dealership," Brooks says, still frustrated. "They're vapor trees." McKnight-Bray also told the Observer what she told Brooks—that the city has a tree bank, but that it can't handle a tree farm. Michael Hellmann, the Park Department's manager of planning and acquisitions, says the current mitigation "tree bank" has around 1,000 trees—far short of the 7,500 trees proposed by Brooks. After two weeks of e-mail correspondence between Brooks and McKnight-Bray, the Park Department issued its "official position": There would be no reforestation tree farm at Samuell Farm. The city's reforestation fund has also had its own set of problems, which became evident after a 2003 audit revealed not only that $40,000 was lost or missing but also that the fund's accounting system was so disordered that checks that should have made it into the fund ended up in the city's general fund or were never accounted for at all. And when it came to actual tree donations, city auditor Thomas Taylor wrote in a March 2003 memo that "there is no follow-up by the arborists or any report from [Park and Recreation Department] staff back to the arborists verifying actual delivery and planting." In other words, there was no proof that developers and other landowners were, in fact, making the donations required under the tree ordinance. After the audit, says city arborist Erwin, "the error was detected and immediately remedied. There's been no problems since...If anything, the process became more efficient." Erwin says he doesn't handle reforestation fund money—that it goes directly to the accounting division—but he was aware that the 2007 cash balance of the reforestation fund, around $1.2 million, "has gone up considerably since then, but [is] well under $2 million." So where does that money go? Neighborhood planting projects and Park Department tree and property purchases, Erwin says. And for now, none of it seems to be coming Houser's way. In late January, Houser appeared before the city council's Quality of Life Committee and presented his ideas for the city to establish an office of urban forestry. He had done his homework, lobbying each committee member over the past year and preparing a PowerPoint presentation filled with colorful photographs of inspiring treescapes. In one of his final slides, he appealed to the city's new green consciousness: "As part of Dallas' leadership in the green movement, it is imperative that we properly manage our green infrastructure to attract business." In the end, Houser suffered a setback: The committee decided to postpone its decision until its scheduled March briefing on the Texas Trees Foundation's Road Map. But things didn't look good. "I had already decided that this was just one battle in the overall war," Houser says. "It certainly wasn't worth pushing hard for, because I wouldn't have gotten anywhere anyway." Better to educate them about the need for the office, he adds, and let them reach their own conclusion that it will be necessary as the Trinity River project comes on line. Even though Houser these days sounds more like an accommodating insider than an outside agitator, the tree activist agenda has had some success at City Hall. In 2006, with the help of a four-year, $100,000 grant from the Texas Forest Service, Dallas hired its first city forester. Karen Woodard currently holds the job and spends much of her time spreading the word about the benefits of trees; at stake right now, she says, is getting the city to fund and implement the management plan for the Great Trinity Forest, which Houser helped draft and provides recommendations for preserving the forest and planting new trees. Stimulus money may help, and private funding for other tree-planting initiatives through organizations such as the Texas Trees Foundation may have more success. But the city has yet to fund a tree inventory and still has no budget dedicated to urban forestry. Instead, tree management and ordinance enforcement fall under a patchwork of departments ranging from public works to police. "We're still way behind places like Milwaukee or Chicago, which have multimillion-dollar forestry programs," says Courtney Blevins, the Texas Forest Service's regional urban forester for the Fort Worth area. But Dallas' tree-consciousness is growing, says Blevins. "We are a long way from where we were 10 years ago." While there remains a divide between the city's words and actions, Mayor Leppert continues to chant his "greenest city in America" mantra. In a memo to council members accompanying the Urban Forestry Advisory Committee's annual report in February, Leppert wrote: "Since Dallas trees and forests represent billions of dollars in green infrastructure that can grow in value when properly maintained, your continued support of the committee's initiatives will leave a legacy of a greener city." Yet the committee's most sought-after initiatives—an office of urban forestry and a tree inventory—seem to get only lip service. When Steve Houser grows weary of this divide, he sometimes resorts to climbing a tall tree and sitting in the sanctuary of its branches. "There's things that go with climbing a tree," he says. "You go up in this 500-year-old tree, and you get out on one of those limbs and sit...It's like you're being rocked back and forth by this ancient, old giant." Houser brushes his hand across the top of his long, straight, blond hair pulled back in a ponytail that falls to the middle of his back. It reminds him there's still a lot of work to do.